I always say that there are as many styles of prepare a paella as mothers or cooks. And all those versions are right. 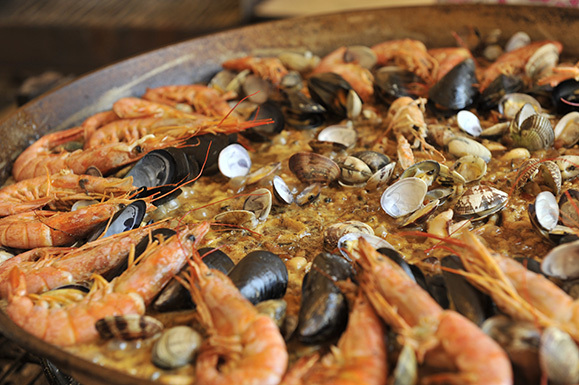 The “traditional” paella is that one, but… what to say to a nice shellfish paella? Here you can find my way to cook it… I learned it from my mother, but I add some of my own with tree slight and optional details, the chili at the beginning, some brandy at the end of the “sofregit” and the use of the cuttlefish spleen. Wash the fishmonk to clean the blood clots that may have. Put in a pot with cold water, some salt, the onion, 2 or 3 bay leafs and the leek and bring it to the boil. When starts to boil we must remove the foam that appears and from there, 5 to 8 minutes in the fire, don’t prolong cooking because it would taste nasty. Strain the broth and we have it ready to use. 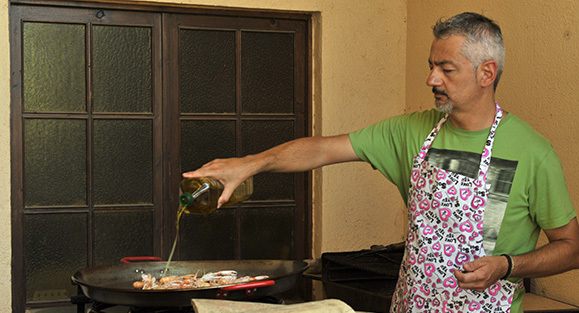 In a paellera, heat some oil in the middle and slightly stir-fry the prawns. Remove them from the paellera. Do the same with the crayfish. In a pot, boil the clams just until open. Discard the closed ones and keep the water. We can add this water to the fish stock. Do the same with the mussels. Stir fry the cuttlefish chopped in 1 cm. squares approx. Reserve the central part with the spleen bag . Remove it. 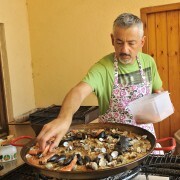 Now the paellera has the oil with the fish flavors. Add the onion chopped in brunoise, the dried cayenne, the grated garlic and sauté it. When the onion starts being transparent, add the chopped red peppers. Take out the dried cayenne, the longer you left it the hottest it will be. I prefer just a slightly hot point. Sauté the “sofregit” which is the basis of the dish until dark golden. But take care not to burn it, because then can taste awful. Don’t cross the red line. 2-3 minutes before that point add the cuttlefish spleen. Cut the bags and add the brown sauce to the”sofregit” and stir up well. Add the stir fried cuttlefish and the rice and stir up for 1 minute. We want that the rice takes the flavors and the oil. Add 2 litters of fish stock. (Two cups of stock for each cup of rice works as well). The rice needs 20-22 minutes to be ready or until takes all the stock. 5 minutes before finishing add on top the prawns, the Norway lobsters, the clams and the mussels. Be creative. Once out of the fire, must rest 5-10 minutes covered with newspapers. Carry out the cooking at high heat except the last 15 minutes which is better do it at medium heat. And that’s it… a dish that once you get it, can be your winning horse!!! Notice that I don’t use, peas, saffron, chorizo, or some of the ingredients that you can find in the more “touristic paellas”… they are just different, not worst nor better. Be creative with the ingredients, over the “sofregit” basis you can add what your imagination can think… I prepare one with mushrooms, black pepper sausages, green asparagus and artichokes that can make you cry of pleasure. Is the brown bag that has inside the head. 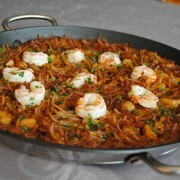 It gives a fantastic iodinated flavour, and for me is the clue to transform a good paella in a 5 stars one. 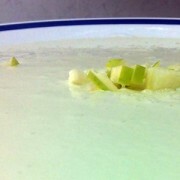 Ajoblanco with sour apple "Granny Smith"
Can you please detail how to remove the cuttlefish spleen? I made this dish once before in a cooking class but I agree the spleen made a huge difference! I cannot remember how to remove it.